Philippe Briand is a self-described sailing purist. He enjoys designing and engineering sailing yachts for those who share the feeling. It comes as no surprise, therefore, that this is the guiding principle behind his new concept design, the SY300. “I picture it being ideal for a passionate sailor who wants to stay in touch with the water and the power of the wind,” he says. “They could even take the helm of the yacht themselves.” Plus, the SY300 is, he asserts, authentically a sailing yacht, not reliant on engines to assist in motion. He’s confident the megayacht will ultimately outperform other similar-size sailing craft. Measuring 295 feet (90 meters), the SY300 is a voluminous 1,500 tons, with three decks. In keeping with the purity concept, as well as efficacy, Briand chose a two-masted rig. Her upwind sail area is nearly 38,320 square feet (3,560 square meters). Downwind sail area, meanwhile, is 71,042 square feet (6,600 square meters), including a 37,674-square-foot (3,500-square-meter) spinnaker. Overall, Briand imparts lessons learned from successful designs like Vertigo and Sybaris. For performance, Briand looked to smaller, high-performance racers. These are entirely wind-propelled, unlike the engine-assisted aspect of so many sailing superyachts. 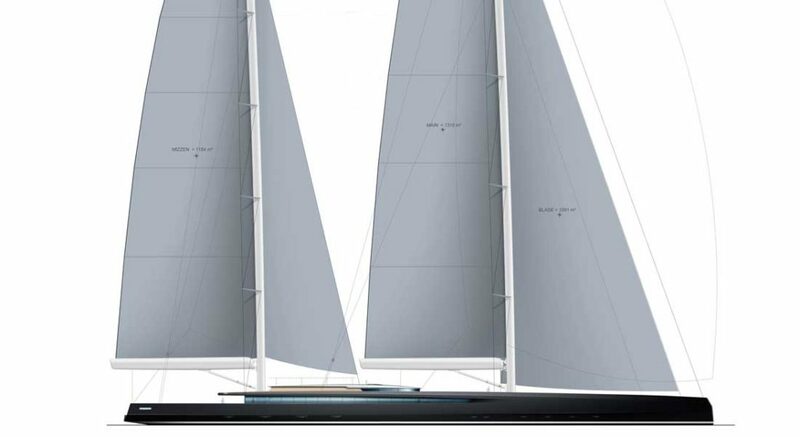 So, Briand says the hydrodynamic efficiency of SY300 could lead to a top speed upwards of 20 knots in ideal conditions. In addition, Briand says the hydrodynamic efficiency could allow underwater turbines to charge onboard battery banks. He calculates that even if the turbines harness just 50 percent of the underwater “energy,” it’s comparable to having a 500-kW genset aboard. All the while, the SY300 should maintain about a 15-knot speed. Briand wishes to develop the general arrangement with a buyer’s input. Regardless, up to six guest suites can sit below decks, while the master sits forward on the main deck. (Don’t overlook the ability to have a private terrace here, too.) Family-focused owners may want a playroom in addition to the main saloon, for one example. Others may want swimming pools outside on each deck, plus a kitted-out spa adjacent to a gym below decks. Forty-six feet (14 meters) of beam provide a lot of other options, such as expansive alfresco dining on the flying bridge and cozy seating area on the foredeck. With a crew complement of 17, the SY300 can become a reality.